@annaleclaire @debaptiste_john @a11Igot @BChassler @PatTheBerner @RoseAnnDeMoro @KillerMike @the_bernie_bro @vinniepaiano @SilERabbit @AOC @PoliticalMemes5 @wikileaks It wasn't a/b Trump. It was a/b keeping the billions in profits from #UraniumOne & the #IranNuclearDeal as well as the 2016 Dem primary rigging, out of the news for 2+ years. Once you see how they are tied to Russian oligarchs & Ukrainian spies, you'll see it makes perfect sense. @annaleclaire @debaptiste_john @a11Igot @BChassler @PatTheBerner @RoseAnnDeMoro @KillerMike @the_bernie_bro @vinniepaiano @SilERabbit @AOC @PoliticalMemes5 @wikileaks It was 1st for those first 2 reason, but once they saw they'd have to cheat to beat #BernieSanders it became even more important to blame Russia for that & to set-up a Big Lie so the MSM would have something spectacular to talk a/b instead of U1 & $150 billion cash to Iran. @annaleclaire @debaptiste_john @a11Igot @BChassler @PatTheBerner @RoseAnnDeMoro @KillerMike @the_bernie_bro @vinniepaiano @SilERabbit @AOC @PoliticalMemes5 @wikileaks Why did Kerry violate Logan to go to Tehran in 2017? Why did neither Trump nor the MSM say anything a/b that? Why did the $150 billion to Iran have to be in pallets of $100 bills? @a11Igot @annaleclaire @debaptiste_john @BChassler @PatTheBerner @RoseAnnDeMoro @KillerMike @the_bernie_bro @vinniepaiano @SilERabbit @AOC @PoliticalMemes5 We've been duped! Out of the news for 3 years. (learn what ‘controlled opposition’ is & what tells & throws are). The State Trooper who escaped... 5 men in SUV.. 4 supposively died.. In total, the gunfight lasts for over 55 seconds. Four officers were killed in the ambush while a fifth miraculously survived. Police say they have arrested one of the gunmen and that the video is part of the evidence against him. 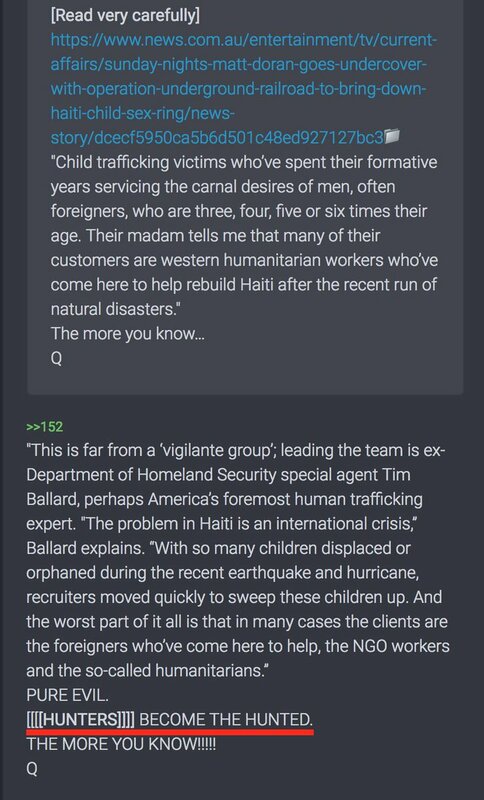 #Q has told us many, MANY times to read the Executive Orders. So, I decided to do a deep dive. 2. 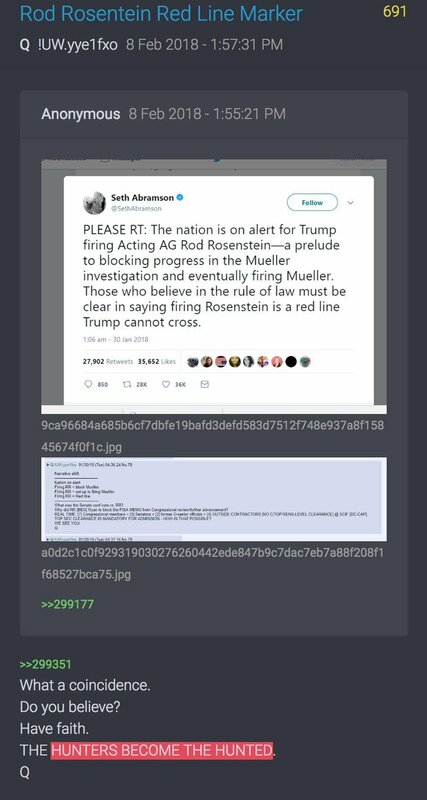 Below I lay out the evidence for President Trump’s plan to issue mass arrests of DS traitors, then try them for treason under military tribunals. 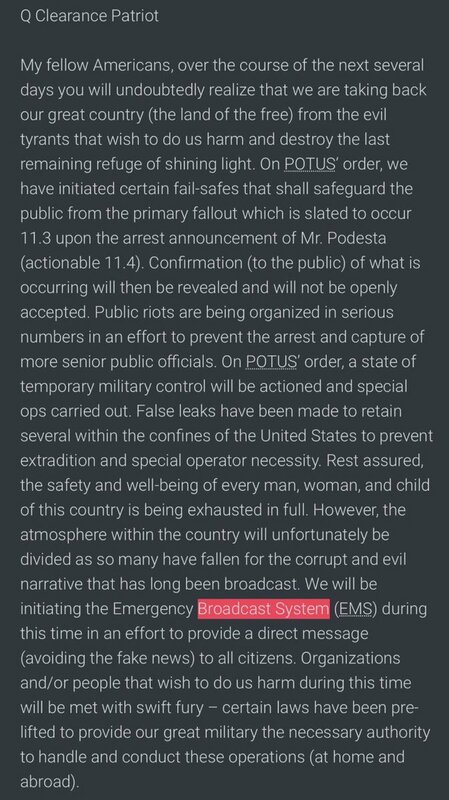 These EO's clearly spell out the timeline, and WHY we haven't seen arrests.. YET. 3. 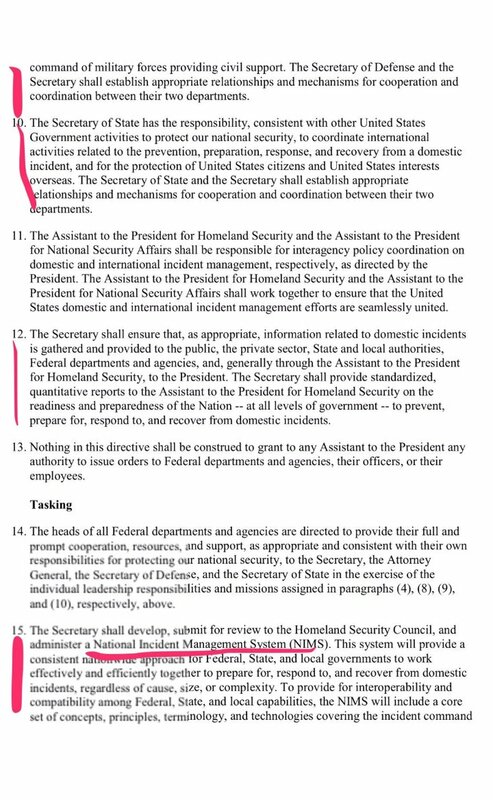 Executive Order 13825: March 1, 2018 - "2018 Amendments to the Manual for Courts-Martial, US"
The Deep State's attempt to start WW3, kill 90% of humanity and create a coup on the government has been axed. 2. 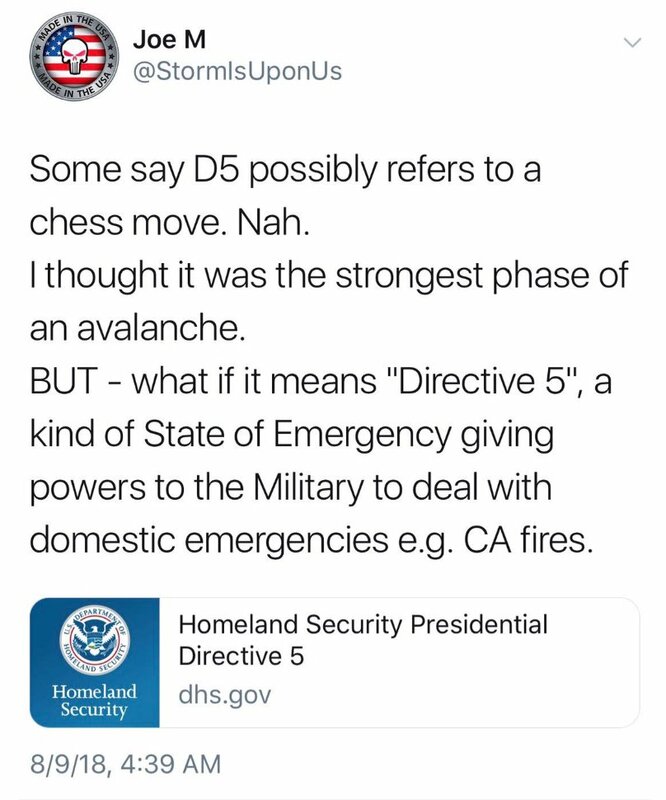 #D5 #Directive5 #DirectiveFive is a Sept. 11 era plan to basically institute #MartialLaw in response to some domestic emergency. It involves the activation of a National Incident Management System (NIMS). 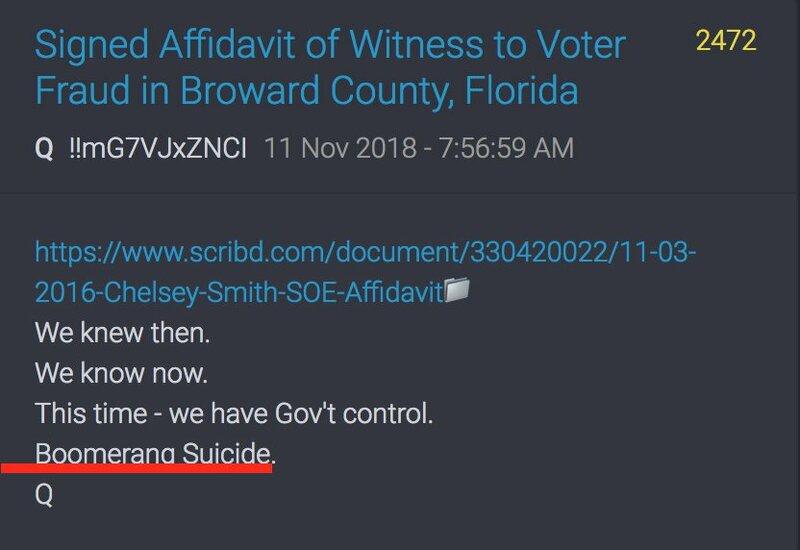 Sounds eerily like Q post #34, the most famous of all. #Coincidence? 2/ Let us know when you realize that the #USMilitary asked @realDonaldTrump to run for #President in 2014 to protect your country & your #Freedoms. 3/ Let us know when you realize that #DonaldTrump is playing #4DChess to eradicate the #DeepState & their co-conspirators. #TheStorm, #QAnon & #TheGreatAwakening will become known as the greatest military op of all time. 1. The weaponization of our society seems to cover just about every facet of #American lifestyle. From life's necessities to technology, to media, even our governing agencies. We have to ask: #WhereDoesItAllEnd?.. in #MartialLaw? 3. Clearly, the single greatest threat to our society and our entire earth is #GeoEngineering - the spraying of our skies by both military & commercial aircraft.